Castle Dykes represents the remains of yet another fortification that can be found in the small South Western Scottish town of Kirkcudbright. The remains further testify to the importance of this small fishing town on the Eastern banks of the River Dee. The remains can be found to the West of the town, on the river banks and near to the swimming pool. Indeed, from Castle Bank, in the centre of town, there is a walk called Castle Dykes Walk, which takes you past the marina and right to the earthworks by the river. Consisting of a network of ditches, banks and flat areas, it’s difficult these days to see how the castle was laid out. A handy information board is present at the site, revealing the floor plan of the castle and a brief history. It seems that the castle consisted of five circular towers, linked together by a thick curtain wall. Surrounding the castle was a huge moat, water filled and fed by the rising and falling tides of the River Dee which will have run much closer to the remains than today. The gatehouse was triple towered. Two round gatehouse towers provided protection for the main entrance into the confines of the castle. A third round tower provided landward protection. There was obviously no need for another tower the other side of the gatehouse as this wall was protected by the sea. To the rear of the castle there were another two towers. The landward tower was curiously larger than its seaward neighbour. 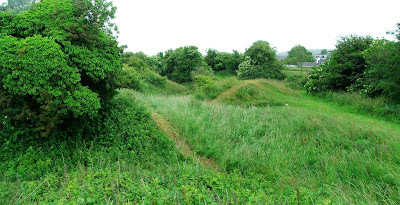 The earthworks generally consist of a huge mound in the centre of the site, some 200 feet by 90 feet in size, very uneven and turf covered (there is no masonry above ground) with a surrounding network of ditches which are as deep as 20 to 30 feet in places. 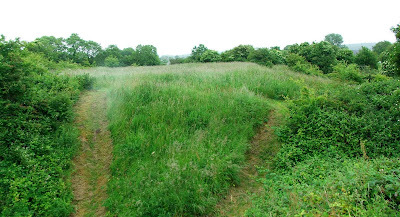 The external bank, beyond the ditch varies in height from 10 to 20 feet high. The castle can be reliably dated to the period of English occupation, from 1288 to 1312. This makes it an Edwardian castle, no doubt used by the English king to assert control for this short period of occupation.Excavations in 1911, 1912 and 1913, revealed buried footings of walls and buildings, and curtain walls nearly 10 feet thick. These walls enclosed an area some 100 by 60 feet, and were defended by the five towers mentioned above. Unfortunately for us, the castle remains have been seriously quarried over the years, hence the lack of any masonry and the general state of the site. Such a major fortification was this castle, that it was far grander and far bigger than the mighty triangular Caerlaverock castle. It is thought that Edward I intended to use the castle at Kirkcudbright as a staging post for his forays into Scotland, as during 1300, the English king brought this fleet up the River Dee and made the castle his base from the 19th to the 31st of July. The King then moved onto targets in the East of Scotland, leaving his young son, Edward (soon to be Edward II) in charge. After Edward I’s death at Burgh-by-Sands in 1307, the castle seems to have fallen out of favour, especially upon the withdrawal of English forces in 1308. Many sources state that the castle was already in a severe state of disrepair by 1335. The castle is first mentioned in 1288, when John Comyn of Buchan was appointed custodian of the fortification. In 1557, Sir Thomas McClellan acquired the now much ruined castle, and, we are told, used much of the remaining masonry to build the castle in the centre of Kirkcudbright. The photos clearly show that there really isn’t much left on site now, and this is probably one of those sites best visited in Winter when there is less greenery around. All in all, a great site to visit, but making sure that you’ve read something about the castle in the first place. Check this link for more information on the castle and Kirkcudbright. Fascinating thank you. I come from Kirkcudbright and didn't know all this. Brilliant! I have had great difficulty finding much about this site. Canmore was quite helpful but your blog is so much more informative.